Here at LNB Towbars & Vehicle Extras Ltd, you can be sure of one thing - high quality installation. We pride ourselves on using the highest quality products, and providing the highest quality proffessionasl installations. So who better to choose to install your Truma air conditioning system. Truma Aventa Compact - The lightest and quietest roof mounted air conditioner in it's class. The Truma Aventa compact offers a range of benefits beneath its compact housing. It is light, quiet and powerful. This is thanks to the use of advanced materials and the constant development of previous Truma roof-mounted air conditioners. Our development engineers were able to reduce the compressor noise to a minimum, for example. This makes the Aventa compact the quietest roof-mounted air conditioner on the market. Weight is saved by using expanded polypropylene for the housing. This means the Aventa compact is also the lightest air conditioner in its class. Its space-saving design makes the Aventa compact particularly well suited for vans. It can also fit on the roof alongside solar panels, satellite dishes or a roof box. But the roof-mounted air conditioner is perfect for caravans, motor homes and liners too. Truma Aventa Comfort - roof mounted air conditioning with integrated heat pump. Truma Aventa comfort cools your vehicle to a pleasant temperature within a very short time. The air is also cleaned and dehumidified to ensure a pleasant indoor climate even with minor differences between the inside and outside temperature. But the powerful roof-mounted air conditioning system can do even more: it can also be used as a heater. Thanks to the integrated heat pump, you can heat your motor home or caravan especially on cooler days in spring and autumn. And it’s extremely energy-saving. Truma Saphir Comfort RC - storage compartment heater and air conditioner in one. Truma Saphir comfort RC is a powerful storage compartment air conditioning system that cools very quickly and efficiently. 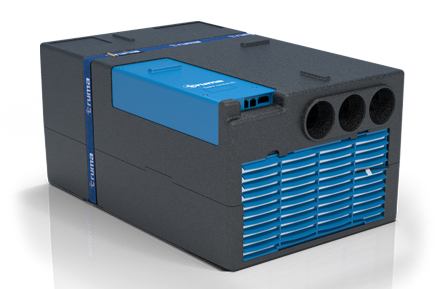 In cooling mode, the Truma Saphir also dehumidifies and cleans the air with the integrated fluff and particle filters. Thanks to the reversible cooling circulation system it can also be used as a heater with heat pump. With a heat output of 1700W, the appliance generates pleasant warmth, especially during spring and autumn. Truma iNet Box - central control unit for Truma networked appliances. 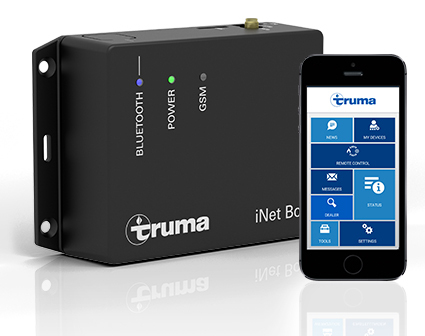 The Truma iNet Box is a central control unit that networks the Truma appliances in your caravan or motor home. Together with your Truma appliances and the Truma App it forms the Truma iNet System. With the iNet Box, you can control your Combi heater and/or a Truma air conditioner remotely from a smartphone or tablet and check your gas supply with the LevelControl.